How close can you get to the beach? The sand almost reaches the Lanai. 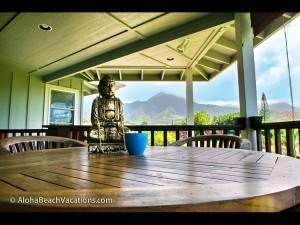 The Anini Beachfront is located on Kauai’s Famed North Shore at Peaceful & Tranquil Anini Beach. 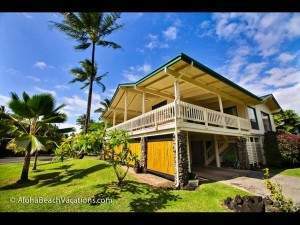 Classic and Casual Beachfront Home about 20 ft to the White Sand. Reef-Protected Anini Beach is some of the Safest Swimming on all the Hawaiian Islands Year Round for All Ages. Excellent Snorkeling Right Out Front. Available for Beachfront Weddings, Receptions, Events, Family Reunions, Retreats, etc. 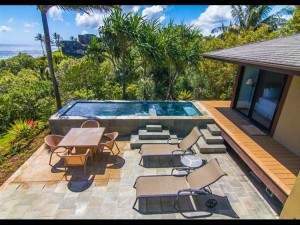 3 Ocean view Jacuzzis/Jetted Tubs & Ocean Views from the Living Room, Dining Room, Kitchen, Lanais & Downstairs Master Suite. 4 Bedrooms Total with a Den (sliding door for privacy) & Upstairs Loft. All Bedrooms have their own Full Bathrooms & 1 Additional Full bath with Shower. WIFI & Fully-Equipped Kitchen.